When you look at the sky at night it is black, with the stars and the moon forming points of light on that black background. So why is it that, during the day, the sky does not remain black with the sun acting as another point of light? In the daytime, the sky turns a bright blue and the stars disappear. Have you ever thought about why the sky is blue in color? Let’s see all the reasons and explanations about the fact here. Let’s study why the sky is blue in color. In the sensitivity, our eyes are more sensitive to light with blue frequencies. Light travels through spaces in a straight line as long as nothing disturbs it. The sky looks blue in color due to the light scattering. As we all know, the Sun is an extremely bright source of light. On the earth, We have an atmosphere. Small atoms of oxygen and nitrogen in the atmosphere effect sunlight. Rayleigh scattering is the physical phenomenon that causes light to scatter when it passes through particles. 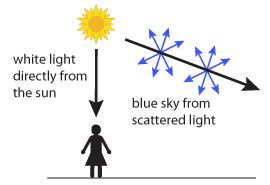 According to it, the shorter the wavelength of the incident light, the more light is scattered. Gas particles make up the atmosphere. These are smaller than a wavelength of light. When light hits a gas molecule, some of it gets absorbed. The higher frequency blue light is more absorbed than the lower frequency red light. After some time, the light absorbed by molecule radiates i.e. releases or gives off the light in different directions. The color that is radiated is the same color that was absorbed, which is a mostly blue color. So, the blue light is scattered in different directions in the sky. This is the reason why the sky is blue in color. Blue light scatters more than red light because it has more.